Although electric mixers, blenders, and food processors make short work of homemade mayonnaise, a simple wire whisk will also do the trick. When using olive oil, extra-virgin is usually too strong in flavor and will not hold together well. Use regular olive oil or half extra-virgin and half vegetable oil. Peanut, canola, and corn oils are good choices. Unrefined oils contain monoglycerides which will result in mayonnaise that separates quickly. In general, the ratio is 1 egg yolk for 1/2 to 1 cup of oil, plus 1 tablespoon of acid per cup of sauce. If you are using vinegar instead of lemon juice, be sure it is a good quality vinegar, preferably white wine vinegar. This will give a more delicate flavor to the mayo. Whipping cream, evaporated (not condensed) milk, or hot water can be used to thin mayonnaise that is too thick. All ingredients need to be room temperature, so plan ahead by taking out the eggs at least thirty minutes before you need them. For a richer mayo, use only the egg yolks rather than the entire egg. To substitute pasteurized liquid whole eggs for fresh egg yolks, use 1/8 cup liquid pasteurized eggs for each egg yolk called for in the recipe. One whole egg equals 1/4 cup liquid. To fix curdled mayonnaise, beat one egg yolk separately. Add one drop at a time to curdled mayonnaise while beating constantly until mayo is once again smooth. Or, slowly drizzle in about 1 tablespoon boiling hot water. Add only enough to re-emulsify the mayo. You can brighten up the flavor of store-bought mayonnaise by adding good wine vinegar, lemon or lime juice. Avoid making mayo during wet, humid weather. High humidity and heat will weight it down and yield a greasy result. Freezing of mayonnaise is not recommended because it will separate. However, some cooks have successfully re-emulsified frozen mayo with a whirl of the blender. When using mayo as a binder, such as in a salad, try reducing the calorie content by using half mayo and half plain yogurt. Unopened commercial mayonnaise can be stored on the shelf up to the expiration date. Once opened, it must be refrigerated but will still last up to a year or six months from the date on the jar. Previously-frozen egg yolks will be thicker than fresh when thawed. Whisk in one tablespoon lemon juice per yolk and freeze overnight for a thick mayonnaise base. When using salt in a cooked mayonnaise, the salt should be added after the egg yolks have cooled to avoid curdling. Salt added to egg yolks in uncooked mayo will result in a thicker base. Cayenne and mustard powder also aid in separating the oil for the proper emulsion. Coat fish filets with a thin layer of mayonnaise and top with your favorite spices. Bake as usual. You will end up with a nicely browned, flavorful coating that keeps the fish moist and tender. This method also works well for skinless chicken. Garlic mayonnaise is known as aioli. 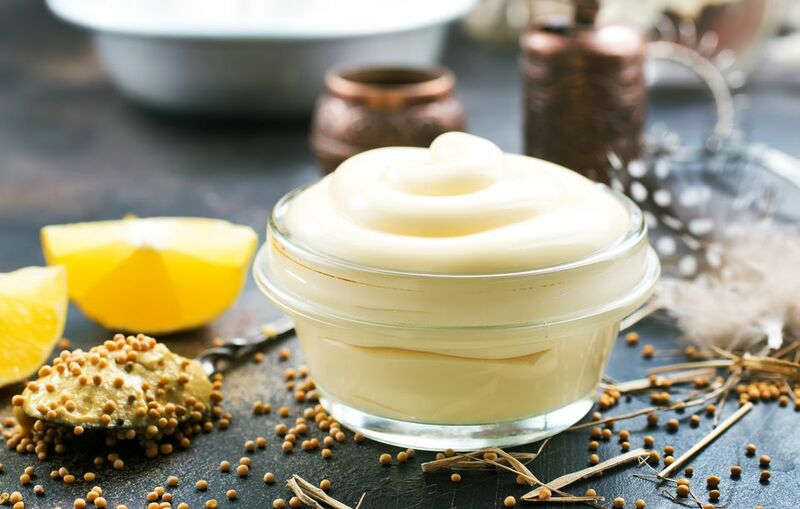 Any variety of herbs, spices or flavorings can be added to flavor mayonnaise. Mince your favorite fresh herbs and add to the mayo. Let sit in the refrigerator for an hour or so to let flavors blend.